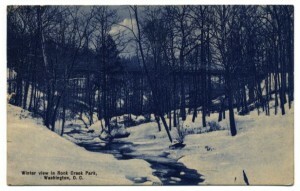 Rock Creek Trestle, ca 1908. Photo from eBay. I have several email alerts set up for items on eBay which match Georgetown Branch related places and subjects. When one comes up, it’s always exciting, especially something I have never seen before. Here is a perfect example. 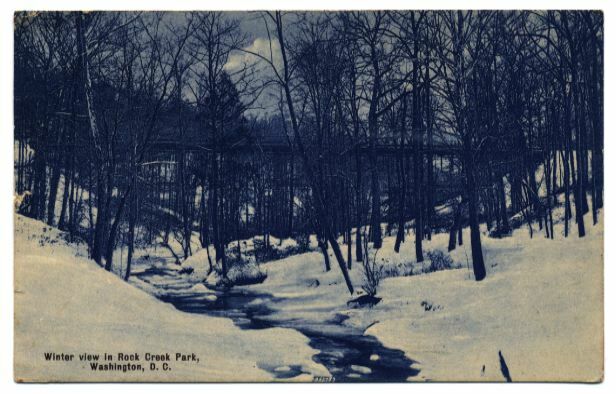 This view of the Rock Creek Trestle is by no means stellar, but it is something new and from a time period that is somewhat of a transition for the GB. It was around this time that the B&O extended the fill on both ends of this trestle, burying the pilings and shortening the elevated section by quite a bit. They were extending the line from Chevy Chase on down to Bethesda, Dalecarlia and into Georgetown. At the same time the tunnel under Conduit Rd. (MacArthur Blvd) was being built and the stone arch in Georgetown was being extended. This was the era in which the Branch as we know it was being “built”. A lot was happening and this is one small, quiet moment from that era.